The theme for the International Yoga day 2018 celebration, organized by the Permanent Mission of India to the United Nations, is ‘Yoga for Peace”. Along with rest of the nation and the world, the 4th International Yoga Day to be observed in Arunachal Pradesh also. Chief Minister Pema Khandu at state level and Prime Minister Naredra Modi at national level will also participate. 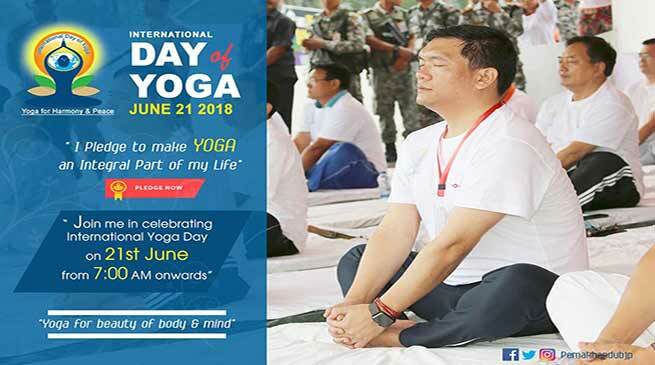 Khandu appeal to the people to come and join the Yoga on 21st June, and celebrate International Yoga day. We often come across with the feeling of being lost or living in uncertainty— detached from the reality and self— owing to pressures of modern hectic life, he added.